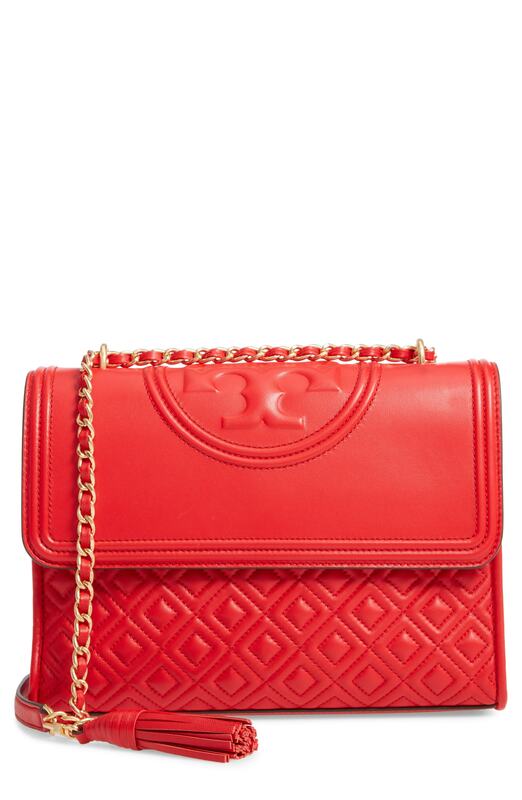 If you're obsessed with relaxed dressing when it comes to your personal style, you'll love this totally chic pairing of a black sweater dress and a red quilted leather crossbody bag. To add oomph to your ensemble, finish off with red velvet over the knee boots. We're all ensembleing for comfort when it comes to dressing up, and this combination of a black horizontal striped blazer and a Tory Burch fleming leather convertible shoulder bag is a practical example of that. Kick up the cool of your ensemble by finishing off with red leather ankle boots. If you're all about relaxed dressing when it comes to your personal style, you'll love this cute combo of a red coat and a Tory Burch fleming leather convertible shoulder bag. If you're all about practicality dressing when it comes to your personal style, you'll love this chic combination of a red floral cardigan and a Tory Burch fleming leather convertible shoulder bag from Nordstrom. For shoes, go down the classic route with red suede pumps. If you're obsessed with relaxed dressing when it comes to fashion, you'll love this chic pairing of a red knit turtleneck and a Tory Burch fleming leather convertible shoulder bag. Bring instant glamour to your look with red leather pumps. If you're obsessed with practicality dressing when it comes to your personal style, you'll love this totally stylish pairing of a blue denim shirt and a Tory Burch fleming leather convertible shoulder bag from Nordstrom. Sporting a pair of teal suede pumps is an easy way to add some flair to your getup. We're all outfiting for comfort when it comes to dressing up, and this combination of a silver sweater dress and a red quilted leather crossbody bag is a great example of that. Spruce up your getup with navy embellished satin pumps. 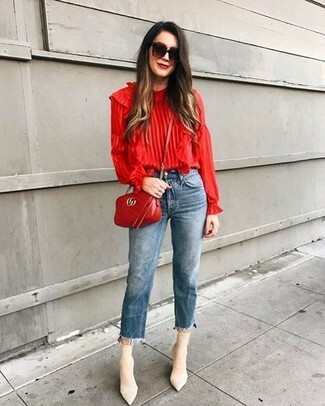 If you're all about relaxed dressing when it comes to your personal style, you'll love this super cute combo of a red ruffle long sleeve blouse and a red quilted leather crossbody bag. Got bored with this outfit? Enter beige elastic ankle boots to spice things up. If you're all about relaxed dressing when it comes to fashion, you'll love this uber cute pairing of a black crew-neck sweater and a Tory Burch fleming leather convertible shoulder bag from Nordstrom. Polish off the ensemble with black elastic ankle boots.